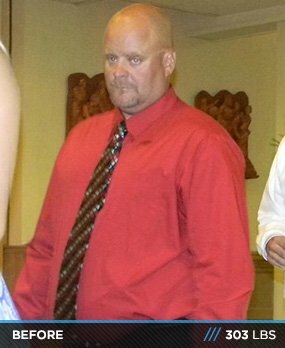 Body Transformation: Larry Lost 111 Pounds In 360 Days! 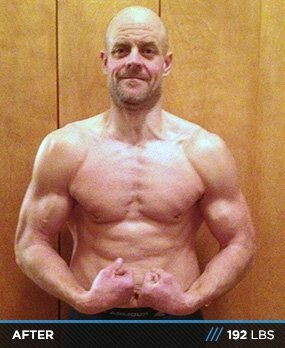 Larry's diet plan was so dialed that he lost four pounds per week for 12 weeks. He lost the remaining fat training for a half Ironman that he later dominated! On January 2, 2012, I weighed 303 pounds. My blood pressure was 174/115. My resting heart rate was in the 90s. And, I had asthma. I got winded walking up steps and got light-headed any time I exerted myself. I hadn't exercised in nearly three years and hadn't lifted weights regularly in 10. I ate whatever I wanted and drank a 12-pack of beer every day. I was a husband and a father of four beautiful kids. I wanted to be a healthy role model and have energy to keep up with them. Honestly, it took a long time to admit, but I wanted to make sure I didn't die from a stroke or heart attack while they were still young. I was backed into a corner and had to make monumental lifestyle changes. When I started my transformation, I was morbidly obese, so I measured progress on the scale. My primary concern at the beginning was to get the weight off as quickly as possible within reasonable limits. I started with small changes and added more over time. The first week, I stopped drinking alcohol and cut out junk food. After the second week, I started counting calories. In the first two weeks, I lost 15 pounds due to water weight and my body being shocked with quality nutrition. I ate 2,000 calories per day and ate six small meals per day ranging from 200-400 calories, each including protein. I ate lean meats like tuna and chicken, whole wheat products, fruits and vegetables, protein bars and shakes, and low-fat dairy (like yogurt and cottage cheese). I lost about four pounds per week eating like this for 12 weeks. I was down 60 pounds. I lost the next 40 pounds in about 12 weeks by training for a half Ironman (one-mile swim, 56-mile bike ride, and 13-mile run). I ate a little more, but because I did so much cardio, the weight fell off. I also started lifting three times per week for 30 minutes, consisting of full-body circuits. My rest periods were short and the rep range was 8-10. I knew there was muscle somewhere under my fat and I didn't want to lose any that I had. After completing the half Ironman in July 2012, I trained and completed another half marathon in November. Training for endurance events ensured that I got all the cardio I needed. My body weight was in a healthy range for the first time in years and I focused on lifting weights. I broke my workouts into two upper and lower-body days per week. In November, I was down to 188 pounds and still carried around a little fat. I started to gain quality muscle weight on a clean bulk diet and followed Jim Stoppani's Shortcut to Size on Bodybuilding.com. I have loose skin issues and thought gaining muscle would help in the long run. 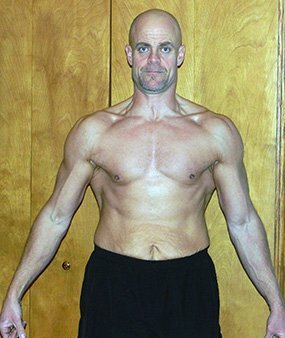 On Jim's program, I gained muscle and weighed 205 pounds. I'm currently trying to finish cutting the rest of my stubborn body fat on my stomach. I'm lifting six days per week and perform morning high-intensity cardio for 20 minutes and low-intensity cardio for 20 minutes at night. I train six days per week and hit each body part once per week. My workouts are all less than 45 minutes. I keep rest periods to a minute to accelerate fat loss. I also throw in rest-pause sets and dropsets to stimulate muscle growth. Most sets are performed to failure. I change up my program every few weeks to keep my muscles guessing. I was been able to make a successful lifestyle change. The diet, cardio, and lifting are second nature to me. My biggest challenge was getting others to understand my new way of life. Many of my friends miss "Party Larry" and want him back. Over time, people around me became more accepting, but people still try to get me down to the bar for beer and wings. Unfortunately, I had to distance myself from people who don't want to accept the way I live now. I don't have any specific fitness plans for the future. I'm going to find activities and goals that I get excited about. I will continue to live a healthy lifestyle. For aspiring transformers: If I can do it, so can you. I had dangerously high blood pressure and asthma when I started my journey and couldn't jog a mile. My first weight training session lasted 13 minutes. You can do it if you create a plan, write out small and achievable goals, and get into fitness for the long haul. It's cool that I can wear size 33 pants and have veins sticking out of my biceps, but there are many more important things I gained. I have self-confidence, energy, and an appreciation for the small things in life. My children look to me as a role model. My 8-year-old son asks me all the time if his food is healthy or not. Once fitness becomes part of your daily life it gets easier. I can honestly say that my first mile jog was a hell of a lot harder than my 3-mile run and 50-minute shoulder workout at 4:30 this morning. I created a habit, and so can you. A healthy transformation is worth it. Bodybuilding.com has been a big help. The first thing I did when I started hitting the weights hard was to buy basic supplements from the site and read featured daily articles at lunch. This helped me stay away from doughnuts in the teachers' lounge. I jump on the forums for a few minutes before working out for motivation. My favorites are the "Post Your Pictures" forum and the "Over 35 Forum."